Allison Rice is a musical performer unlike any you've seen before, unless you've seen a 10 foot tall classical violinist in elaborate costume! 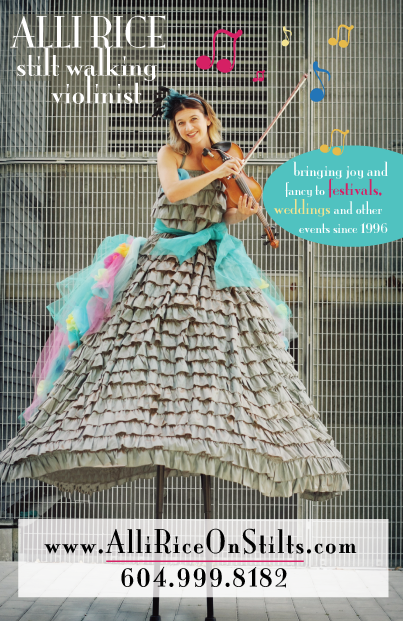 From atop her stilts, Allison has traveled the world entertaining children and adults alike with her graceful presence and charming interactions with her audiences. Allison's story began a a six year old violinist with a passion for music. Also, very athletic, Allison learned to walk on stilts as a teenager at a festival. A few years later she came up with the genius idea to combine the two, and so her unique act was born! As well as being a performing artist, Allison is also a certified Clinical Counsellor, having completed her Masters Degree in Counselling Psychology. Allison's private Counselling practice focuses on family and relationship challenges, something that proves to be another outlet for her compassionate and giving nature. For Allison, both career paths are all about giving of herself, albeit in very different ways.